I wish for more space and wider hallways. Shops will never disappear, so more space is needed. At least in the schengen part they have stopped shops using up 3m of the corridor with stock displays, although that part of the terminal is still crowded (I always use the security at the western end of T2). I noticed the airport website now gives instructions how to avoid the mandatory walk through some of the tax-free shops (T2 schengen) although for T1 you have to ask the staff to lead you through the "shortcut" (unless you follow somebody who happens to go through with the access key). There is no suggestion for those flying T2 non-schengen though. Their suggestion for avoiding the T1 shop is to "agree an alternative route with the T1 shop supervisor", although quite how you are supposed to talk to the shop supervisor without going into the shop you are trying to avoid is a mystery .. stand just outside it and shout and wave to them?? It's one thing that the Premium lounge is closed because of this mess and the normal lounge is overcrowded. But the worst part is that the bar looks like this 80%-90% of the time. There is some staff walking around but they are only interesting in collecting plates. The first time I was in premium lounge was in the morning. I saw the empty bar, went there and made me a G&T. I thought it was selfhelp like in many lounges. No no... This is the "normal" non-Schengen lounge, not the premium one. Anyhow, the last time I saw staff behind the bar they refused to serve me a second GT because I don t look "fit", I had an inflammation on the eyes. They told me that I better stop drinking if I want to get on board of my flight. So took some self service wine. That was not appropriate in my opinion. Ed Size and remymartin like this. I do not understand the concept of having alcoholic beverages locked up this way. 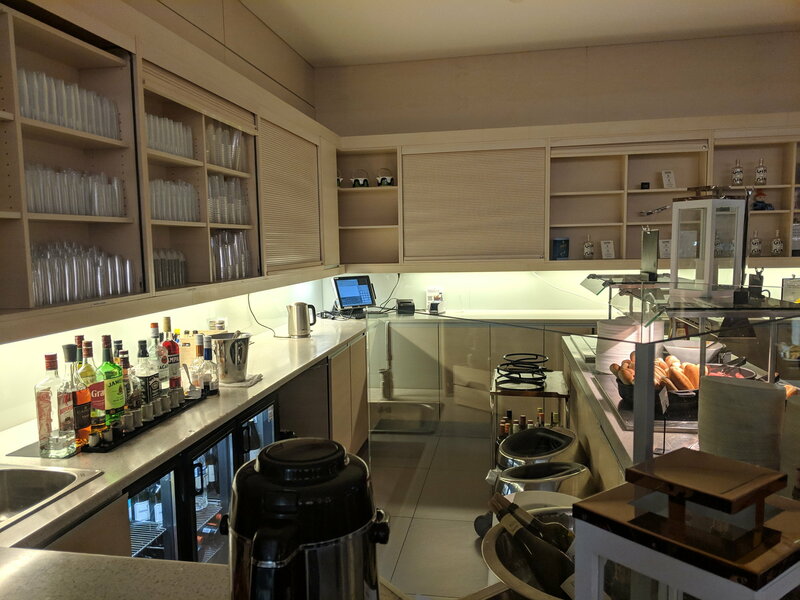 In most lounges (bar a few odd ones here and there) it's all ready on a help-yourself basis... Why can't this be the same at the HEL AY lounge? Apparently extension and plaza in non-schengen area opened today. Does anyone have pictures/experiences yet? Does anyone know if the route from the terminal to Hilton is still the same or if there have been changes due to construction? Any free buckets for line up at new Plaza ? cistavoda, FFlash and Steve_Hun like this. its BaD i nearly slipped! that video link above by Wilco tells all. I did not take pictures, it was not that ”incredible”. While then Plaza (Aukio) is nice , I can inagine it will be a crowded plaze whennoperative and then it is not that nice relaxing place with music and that. I did not see the ”unique” elements quoted what or where they were. intuition and esledo like this. Aukio is rubbish. Or maybe not rubbish but nothing special, either. A small open space in front of transit security, comparable to about half the size of an average SIN gate area. Lol. My guess is that 85% of pax will not recognise any special features. How long will it take before they remove the seating and replace it with a cafe or shop? vulle and FFlash like this.